I make Hummus quite often, and use my food processor to chop the chickpeas. This yields a sort of coarse paste, which is a little better if I peel the chickpeas first. Adding liquid to the mixture doesn't seem to help much, but only leads to watered down Hummus. I would like to get a much smoother paste, that resembles restaurant Hummus more closely. How can this smoother paste be achieved? Since you didn't post your recipe, I'm not sure what your ingredients are, but if adding water makes your hummus too watery, I'd try increasing the amount of oil. In addition to TFD's answer, I'd like to add that I use an indian food grinder, rather than a food processor or blender, to puree dips like hummus and baba ganouj. It does a vastly better job than a food processor does. Sorry, canned garbanzos can work too. Drain the beans, put in a blender or food processor with a small amount of chicken stock or liquid from a can. Season with salt, pepper, cayenne, garlic powder, and cumin to taste. Blend till smooth and serve in a bowl with drizzle of olive oil. Easy and yum. 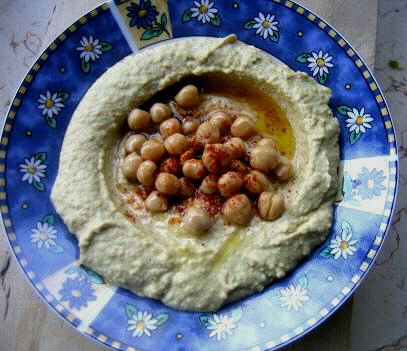 The coarse paste texture suggest that the hummus does not have enough moisture. You can correct that situation either by adding more olive oil or adding more water. Oil will add more flavor, but water will make for a more healthful result. I tend to compromise by adding the amount of olive oil called for in the recipe, then drizzling in water a little at a time until I get the consistency I want. I'd suggest soaking the hummus overnight with a very small amount of bicarb soda (maybe a 1/4 teaspoon), adding the same amount when cooking. If you can be bothered peel the skin and grind when the chickpeas are still warm. For a whiter hummus, blend the tahini and lemon juice first before adding the other ingredients. Reserve some of the cooking fluid and add it in if required to achieve a smooth paste. You shouldn't need to add any olive oil to the hummus, it's traditionally drizzled on top, not added to the mix. I feel that machine blending adds much air and 'fluffiness' to hummous and should be kept to a minimum by thorough cooking. The goal should be whole yet completely tender beans. Slow cooking in slightly alkaline water, as suggested above with soda, gives best results. Slowing the soaking by using cold water overnight in fridge often helps prevent splitting and exploding. Sieving out hard bits after blending is time-consuming but will give that extra smoothness. If there are still troubles, you're not crazy: different crops and storage time all affect results. The complicated chemistry of beans keeps food scientists busy! Try a different batch. Sorry to all the purists, but the best trick is to mix equal amount chickpeas and a small white bean like navy beans. The taste is not noticeably different, but much, much smoother. Not the answer you're looking for? Browse other questions tagged equipment middle-eastern-cuisine grinding or ask your own question. How does one peel and puree chick peas with a food mill for hummus? How to get cheap cookie cutters? Where can I get Chocolate Bar shaped silicone molds from in the UK? How to get falafel to hold together when pan-frying? How does the heat energy from the sun cook an egg within 5 minutes? How to make ground almonds creamy? How to get heat high enough for stir fry? How smooth is peanut butter? How to prevent liquids from spilling when pouring from measuring cup?